When my wife Jodi Quesnell was the editor of the Wirenews (the official publication of the German Wirehair Pointer Club of America) I would write a column for each issue about hunting trips with the dogs. I enjoyed writing the stories and sharing my experiences with other people, but not enough to volunteer to meet the deadlines for other editors once Jodi stopped being editor so she could go to school to get her masters degree. I have the bug to write again. I decided a blog might be the best way for me to get my stories out there for other people to enjoy. But this time I want to concentrate on species specific stories with the dogs. I’m self-employed and spend seven months working very long hours so I can hunt a lot during the five month upland game season. Some years I will hunt 120-130 days with my dogs. I also hunt rabbits and turkeys with the dogs in the spring. I do a little training, but I hire other good trainers to do most of that for me. I do some water fowl hunting, but usually it is just for the dog’s sake. I don’t like eating ducks, and I probably shot enough ducks as a teenager to last me a lifetime. 99% of my hunting is on public land, and usually in some big country. A little about me. I was born and raised on a ranch in southern Idaho. I spent the first thirty-seven years of my life in Idaho except for the four years I was in the Air Force stationed in Grand Forks North Dakota (burrrr). I started packing a .22 rifle around the ranch shooting ground squirrels and rock chucks when I was eight years old, and I haven’t stopped hunting yet. The only hunting dogs I had growing up were our Australian Shepard herding dogs. They are better at herding cattle than retrieving birds, but we still tried to use them as bird dogs. I’ve got some good stories to tell about those times. I shot so many ducks on our ranch and ate them every way possible that I can’t really eat a duck any more. I did plenty of upland game hunting all without a dog, and quite a bit varmint and predator hunting, and of course lots of big game hunting. When I was twelve I started chukar hunting with a buddy and his dogs. All I remember about them is they were shorthairs or pointers, and they were long range flushers most of the time. That didn’t bug us because we just watched where the birds flew off too, and went after them with our young legs. I was hooked on chukar hunting and burned up a lot of boots chasing the birds up and down steep canyons during my teenage years. In my twenties and thirties I spent a lot of time big game hunting in the Frank Church Roadless Wilderness area of central Idaho. There were many times me and my hunting buddies would spend a couple weeks camped miles from any road. I also spent a lot of time hunting by myself in the wilderness area including sixteen days looking for a big horn ram. 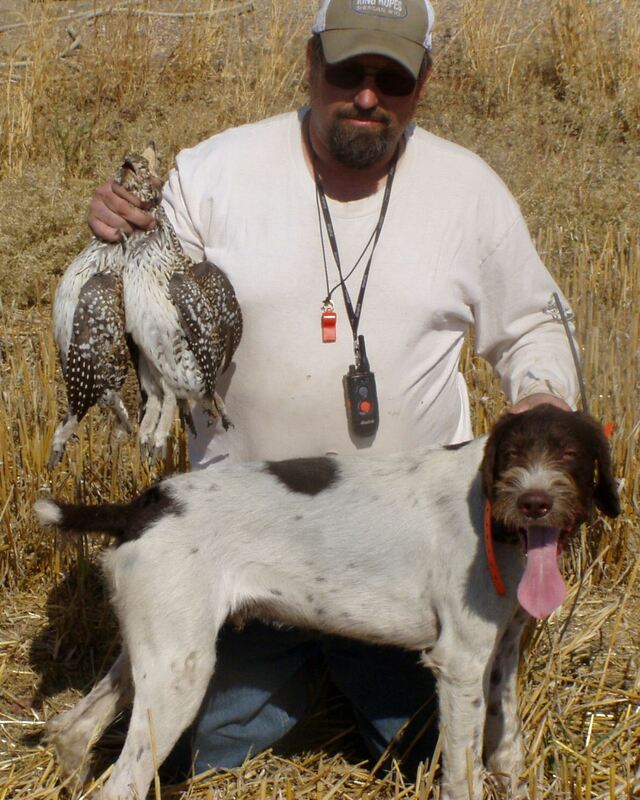 I still found plenty of time for upland bird hunting, but it wasn’t until I got my 1st German Wirehaired Pointer in 1999 that I realized just how much better hunting was with a dog. Since then, Jodi and I have spent about equal amounts of time living in Idaho, South Dakota, and Wyoming. I have been real lucky in life to have lived in states with so many hunting opportunities, and I have taken advantage of these places. In August 2015 we moved to western Washington and I now have the challenge of hunting in the thick jungle like timber here in western Washington. I have hunted with my dogs in many states, for many different species of game, and in about every terrain, and weather conditions possible and I will be adding to that list over the next few seasons. I’m at the point where I only shoot game for my dogs as a reward for a job well done. Most days that is probably one bird, or a rabbit, seldom a limit of anything. If I wanted I could shoot hundreds of birds and many rabbits each year. I have figured out the difference between killing and hunting, something I don’t think many people actually understand completely. I have decided to share some of my hunting experiences with any readers who might be looking to go hunting with their GWP. Tom about time you told some tales of your hunts. I will be a regular. Great intro! Now let’s get to hunting.